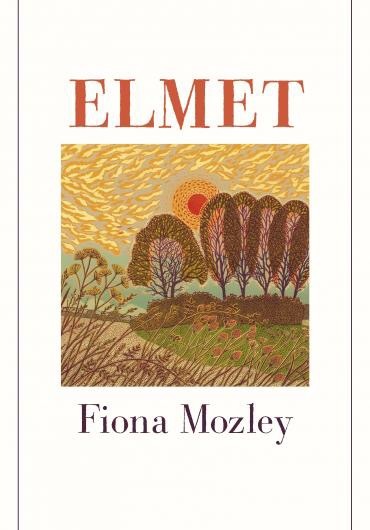 When the Man Booker long list was announced I had not heard of one of the entries, ‘Elmet’ by Fiona Mozley, and I must confess in all the following conversations about the roster of Big Names who had secured their places once again, I didn’t dig too deeply to find out about it. Although I may have anticipated some of the names on that long list, what I certainly had not forseen was a long delay in an airport as we were told it was in no way safe to get on our plane that had just bumped along the runway to collect us. Time + bookshop + forgotten national book token in purse = another paperback struggling to find a place to be housed in my flat. The bookshop had a section for the Booker offerings and although I hadn’t intended to stop there my eye was immediately caught by the cover of Elmet. Clean white lines with a central design by the artist Vanessa Lubach showing an Autumnal scene ticked my book boxes and I decided to go for it with little attention given to the blurb. Reader, I take pride in myself here, I made an EXCELLENT decision. This book was read in a couple of sittings but I could easily have lost a whole afternoon to seeing it off from start to finish if time had allowed. When I’d reached the end I was recommending it to others saying how much I enjoyed it, but what I did not anticipate was how much the book would stay with me. I have not been able to stop thinking about it, and with every passing day my enthusiasm for it grows. Now I must confess ignorance in that I did not have a clue as to what ‘Elmet’ means, assuming it would be revealed in the novel itself, but those who hark from God’s Own Country and wear the White Rose upon their chests may not be so blindsided by the word. Between the 5th and 7th century Elmet referred to an area of Yorkshire and this is the scene for our story to unfold, but in a contemporary setting. We are told the story by our young protagonist Daniel, who is currently travelling northwards, as he looks back to a time with his sister Cathy, their Daddy and a night that changed everything. The three are a solid unit, needing no others, living in an isolated fashion that confirms this to the outside world. They live in a secluded, wooded area in a home their Daddy has built himself. Attuned to and respecting nature, they have left formal education and rely on their father to advise and provide them with all they need. Daniel appears to be a gentle soul while Cathy has more of an untamed spirit that knows of future battles that will lie ahead for them. Always ‘daddy’ to the children, their father is a character I could read about for hours, a beautiful study of the light and shade that can exist within one person. I found the book to be almost a quiet contemplation on violence, how it can live within a person with a need to sometimes be purged. Their Daddy is somebody who holds violence in him, a man who is a huge, hulking presence and is widely known to be the best fighter in the country. He doesn’t live his life within the lines of the law but he does believe in a code of ethics within the world he inhabits, doing things the right way. Paperwork, legal business and suit and tie living may not be his area, but he will defend his children to the last and will work hard for those he loves. The contradiction in his behaviour is strikingly played out as we watch violence pulsing from his every fibre as he fights in a forest to the next moment the calm, tender time as he lays his body back to have his hair washed by his children, vulnerable and at peace. The way this family conduct their lives does not sit right with all those around them, and a dispute over the land they have built their home upon soon starts to cause tension not only for them but within the whole community. The story slowly burns and builds like blood boiling before a moment of unbridled aggression. Beautifully written throughout, the language is lyrical with local dialect slipping on to the pages. I’ve rarely found myself so taken aback by the final quarter of a novel and so thoroughly satisfied with how a story played out, I feel like Mozley hasn’t put a foot wrong with this piece. Will it win the Booker? I’m not sure to be honest, a lot of people think it is Ali Smiths time and George Saunders is up there too, but if her name is called out from that podium I will be cheering on a very well deserved win.